T knows all about Santa. One of her favorite books is The Night Before Christmas, and she’s seen enough of Frosty the Snowman and Rudolph the Red Nosed Reindeer to ensure that the image of that jolly elf in his red suit has been seared into her mind forever. She also knows that stories are just that – stories. We’ve told her that at Christmas time some people like to pretend that Santa is real, but that children might not know stories aren’t true. So we don’t tell them because it might make them sad, and we don’t want to make anyone sad at Christmastime! 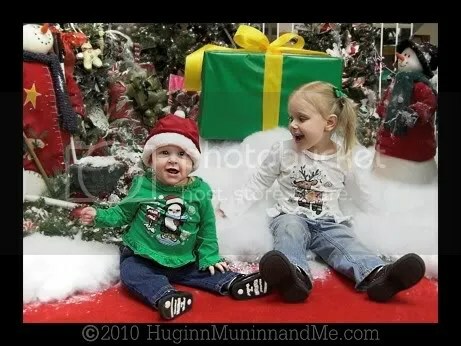 But we still thought it would be fun to go visit him in his Christmas kingdom at the mall! T calls him “the guy dressed as Santa,” because that’s exactly what he is! She wasn’t in the slightest bit shy about it, and gave him an earful when he asked what she wanted for Christmas, her number one priorities being a Scout and Violet dog – Scout for her and Violet for her sis (don’t worry, Santa, it’s been taken care of). 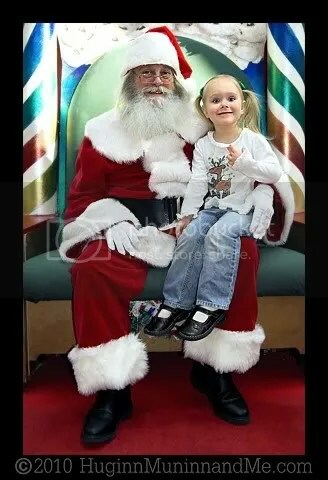 After she was done, the man who’s dressed as Santa asked if Ro would like a turn. And wonder of wonders and miracle of Christmas miracles. . . 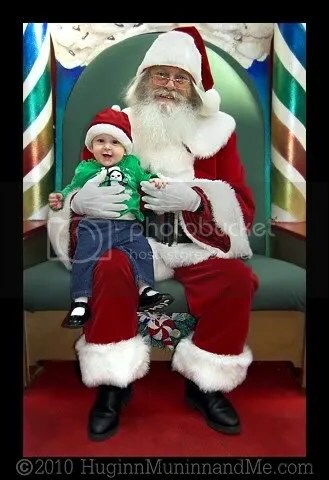 I don’t believe I have a picture of my baby SMILING on Santa’s lap! Everyone knows that all little babies are terrified of Santa, and Ro won’t even let her grandmother hold her! She’s such a silly little goose, she must have thought he was a giant fuzzy stuffed animal. Red is her favorite color. . . maybe it was the (adorable) matching hats that she found so amusing. I know I did! SO cute! All Trent really knows about Santa is that he’s a big happy guy who comes out at Christmas time to pass out candycanes to good kids. It cracks me up everytime people ask him what he wants from santa and he says “a candycane”. As usual your posts don’t disappoint!! So glad all was smiles and giggles with Santa! Cute pics. I couldn’t believe that both my kids sat there too. Tori said she wanted to, but I was still skeptical. Very cute shots. 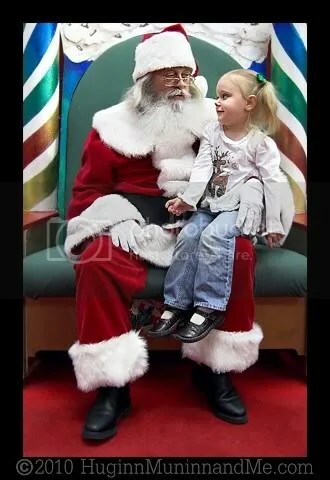 But I have to admit, my favorite picture of Nola is the one of her terrified… and the Santa looks scared too! Is that bad of me? HA! p.s. kudos to you for taking your own pictures with santa! Awww I’d heard the story but the pics make it extra fantastic! goodness, how sweet! I had a screaming baby this year! I admire you for telling T the “truth”. I started thinking this year how its kinda cruel (is that too strong?) to let on about Santa. Still having mixed, undecided feelings about it all. You are such a great mom! !